Facebook is moving forcefully into the personal space of LinkedIn today with the announcement that it’s rolling out new features that will enable job posting and application directly on the site. 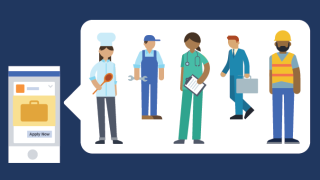 In a blog post, Facebook stated that starting today businesses in the US and Canada would be able to post job openings which future employees would be able to easily find either on that business’ page or in the new jobs bookmark. According to Facebook, the entire process will be simple for businesses as page admins will be able to set up job listings, track applications and directly communicate with applicants all on the Facebook site. Things should be simpler for applicants too. Rather than trawling through several job sites, the idea is that you could come across your dream position simply doing your habitual News Feed scroll. Though you’ll also be able to do a more targeted search and find postings in the jobs bookmark and on specific pages. To apply for a job you simply click the Apply Now button and a form that’s been pre-filled with all the information you’ve already supplied to Facebook via your profile will appear for quick and easy submission. To add more convenience it can all be done on your mobile too. This isn’t the first step Facebook has taken into our working lives. Late last year the social media giant launched Workplace, a kind of cross between Facebook and Slack that allowed people to stay connected and communicate in their workplace without using their everyday Facebook account. That said, this particular feature does use your personal Facebook profile so if yours doesn’t quite paint you as a professional paragon, we’d advise you to fix it up before you start applying for anything. At the moment the feature is only available to users in the US and Canada with no indication as to when or if it’ll be available in other regions.